China has successfully launched its second manned spacecraft, carrying two Chinese astronauts into orbit. 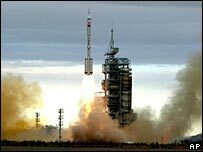 The lift-off, from Jiuquan in the Gobi desert, was shown live on state television and included views from a camera on the outside of the craft. The mission is expected to see the Shenzhou VI orbit the Earth for five days, during which the astronauts will carry out experiments. It comes almost exactly two years after China's first manned space flight. In a sign of growing official confidence about the programme, the launch was announced in advance and broadcast in full on state television. The two men chosen for the mission, former fighter pilots Fei Junlong and Nie Haisheng, were selected after a rigorous screening process. TV pictures of the two men were seen by millions of people across China, as the rocket blasted off at 0900 local time (0100 GMT). "Feeling pretty good," Mr Fei said, in the first broadcast comments from the craft. State television later reported that the two men had eaten pineapple-filled moon cakes for breakfast. The astronauts' mission is expected to be more complicated, and last longer, than the 2003 launch. China's official media has speculated that the space capsule will be in orbit for five days, circling the Earth up to 80 times before landing in the Chinese region of Inner Mongolia. China's official media said the astronauts would take off their space suits and travel back and forth between two parts of the spacecraft - a re-entry capsule and an orbiter. They are also expected to carry out various experiments. Shenzhou VI, like Shenzhou V, has been influenced by Russia's Soyuz spacecraft, a model developed in the late 1960s. Shortly after the take-off, Chinese Prime Minister Wen Jiabao congratulated all involved in the programme, saying the flight had been a "success". China's first manned space voyage two years ago made it only the third country to launch a human into space on its own, along with Russia and the US. 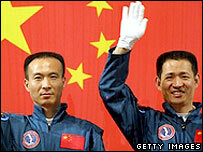 The astronaut chosen for that mission - Yang Liwei - was hailed as a national hero on his return to Earth. A Chinese official was quoted by Xinhua as saying that spending on the Shenzhou project had reached $2.3bn, compared to US' annual space budget of $16bn.